Today, I'm reviewing The Inn of the Sixth Happiness (1958) starring Ingrid Bergman as missionary Gladys Aylward. 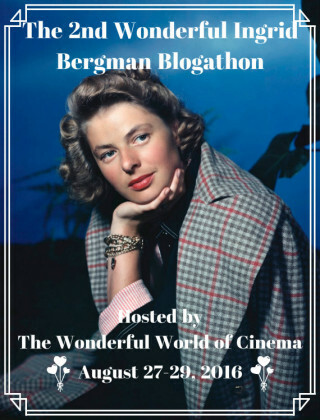 This article is part of The Second Wonderful Ingrid Bergman Blogathon hosted by The Wonderful World of Cinema. One of Ingrid Bergman's most radiant performances is in the drama, The Inn of the Sixth Happiness (1958), where she plays English missionary Gladys Aylward, who devoted her life to helping the Chinese people. The Inn of the Sixth Happiness follows Aylward's story from the time she is a housemaid in London who longs to become a Christian missionary to China. Aylward is rejected by her church's mission because of her lack of formal education, but the determined woman books a railway passage to China anyway, where, thanks to the recommendation of her former employer (Ronald Squire), she becomes the assistant to an elderly missionary (Athene Seyler) in rural China. At first, Aylward has trouble adjusting to the local customs, but eventually she becomes a beloved member of the community, even becoming a much-trusted adviser to the local mandarin (Robert Donat), until the Japanese army invades China during World War II. The Inn of the Sixth Happiness is based on the novel, The Small Woman, by Alan Burgess, which chronicles Aylward's amazing life story. 20th Century Fox bought the rights to Burgess' novel shortly after it was published, and producer Buddy Adler hired a renowned international cast that included Donat in his final film role, Austrian actor Curt Jurgens as a Chinese army officer who falls in love with Aylward, and Bergman, who had recently made her Hollywood comeback in Anastasia (1956) and Indiscreet (1958). The Inn of the Sixth Happiness does take a few liberties with Aylward's life story. Some names were changed and the pious Aylward never embarked on a romance with a Chinese army officer or anyone else, but in many other ways the movie is an accurate portrayal of Aylward's experiences in China. The real Aylward did travel across Europe and Asia by railway to reach the rural village, and she did befriend the local mandarin, who converted to Christianity in her honor. Most astounding of all, during World War II she did lead a group of around 100 children to safety while climbing over dangerous mountain terrain and dodging the Japanese army. Go here for more of Aylward's life story. Viewed today, The Inn of the Sixth Happiness is an old-fashioned delight. The location shooting in North Wales, which stands in for the mountainous landscape of rural China, is breathtaking, especially during the escape scenes, and the performances are outstanding. Even Jurgens, who has the unfortunate task of playing a half Dutch, half Chinese officer (Sean Connery wisely turned this part down), gives a creditable performance, but the outstanding supporting part is played by Donat as the witty and wise Mandarin of Yang Cheng. The Academy Award-winning actor is always a welcome presence onscreen, but his death from a cerebral thrombosis only a short time after completing the movie, makes his performance especially poignant. His final goodbye in the movie is a fitting valedictory for a fine actor and a true gentleman. 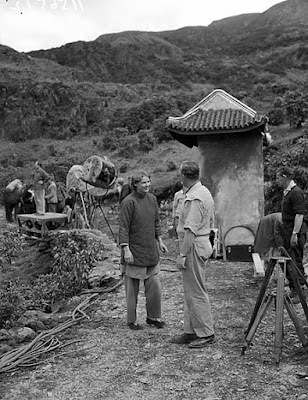 Ingrid Bergman filming The Inn of the Sixth Happiness (1958) in North Wales. Despite the great supporting cast, The Inn of the Sixth Happiness belongs to Bergman. Her performance as Aylward is one of the best of her distinguished career and a masterclass in movie star acting. The statuesque Scandinavian Bergman looked nothing like the diminutive Cockney Aylward, but Bergman's performance is true to the spirit of her character. Throughout the film, she convincingly portrays Aylward's feisty behavior -- it takes rare courage for a lone woman to stand up to the Russian, Chinese, and Japanese army -- but Bergman also conveys Aylward's great love for the Chinese people, especially the children. The final scene is a sentimental three hankie sob fest in the best old Hollywood style, but it is made transcendent by Bergman, who even though she is covered in dirt and dressed in rags, shines with an inner light. I'll leave you with the children's song, "This Old Man." 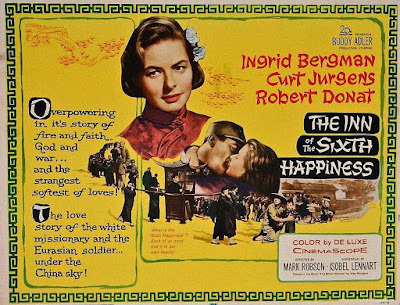 It is heard throughout The Inn of the Sixth Happiness, and it became a pop hit after the movie's release. 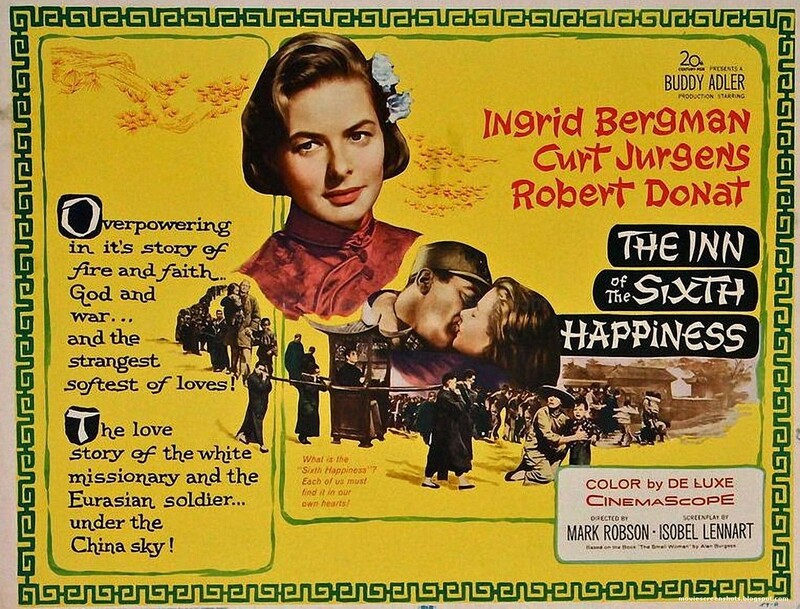 The Inn of the Sixth Happiness is available for streaming on Netflix Instant and for DirecTV subscribers. It is also available on DVD. Blu ray, and video on demand. What a wonderful piece Amanda! I was looking forward to read it because I love this film, and I'm glad to see that you like it too! It's my second favourite Bergman's film after Spellbound :) Thanks so much for your participation to the blogathon! Ingrid is so wonderful in this movie, although it doesn't get talked about like some of her other films. It was a treat to review it. No indeed, I think it deserves more recognition! It's crazy to think that this film is so often overlooked when it has so much going for it. A great director, an interesting story, and the fabulous Ingrid Bergman. I remember that it was on cable a lot during the 1990s, but it seems like you hardly see it anymore.